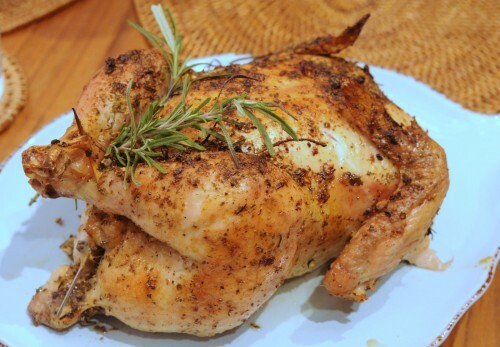 Baked whole chickens are just about the simplest thing you can make with limited time and resources and still come out with a creation that would merit the reaction “Wow!” I made it first in high school under the direction of a teacher who also taught me how to make lasagna. Doesn’t it look amazing? So easy! Many years later while broke and jobless in a house in Quezon City, Philippines, we gathered our resources to buy a whole jumbo chicken which I marinated and baked. We ate it for Christmas dinner and proceeded to cocktails and guitar playing. And then our dog named Vishnu quietly reached up onto the dining table and grabbed the rest of the chicken, prompting our screams as she ran out the door. Vicoy, an uncle figure in that household, chased after Vishnu and pulled the bird out of her mouth and brought it back inside. We then asked what he planned on doing with a carcass that had already been inside a dog’s mouth and on the ground. Disgusted, he threw it back out for Vishnu to feast on for her best and last Christmas. (Poor dog died the folowing year shortly after nursing her only litter.) But again, I digress. 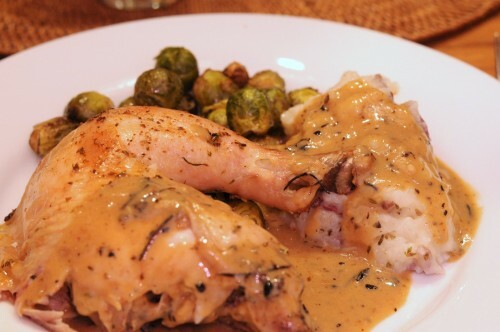 This gravy is so simple but so rich with the flavors of rosemary, oregano and garlic. Serving a whole roasted bird with shiny brown crispy skin could be just as rewarding as serving a labored-over lasagna. But the difference in prep time and the versability of a baked chicken is hard to beat. I hope you enjoy one of my favorite dishes to make and I hope you also get the WOW you deserve. Wash the chicken well, removing all giblets and fatty tissue. Dry very well inside and out with paper towels. Rub the skin and cavity generously with salt and dried garlic and stuff with half the rosemary and oregano, as well as the whole onion. Skewer the opening closed using a wooden or metal skewer. Truss the chicken by tying the legs and wings together using kitchen string or more skewers. For a video on trussing, see here. Trussing allows for even cooking, containing moisture inside the chicken, as well as maintaining an aesthetic appearance. Place the chicken breast side up in a baking dish and sprinkle with remaining garlic, stuffing rosemary and oregano between arms and legs. Set aside to marinate for an hour. Allowing the bird to air dry in room temperature also helps with the crispiness of the cooked skin. Bake in a pre-heated oven at 450F for 45-60 minutes, checking for doneness with a meat thermometer. Brush the bird’s own juices on its body every 15 minutes, adding olive oil if necessary. Broil to brown the skin when done and transfer to a serving dish, saving drippings for gravy. 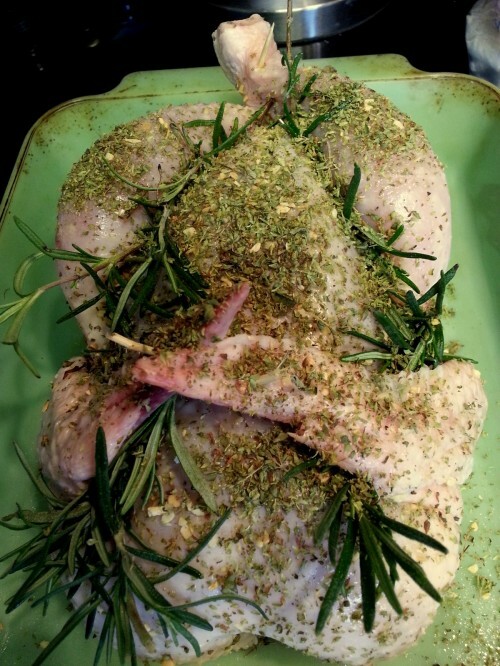 Garnish with rosemary sprigs and allow to rest for 15 minutes before serving. As soon as the bird is transferred to a serving dish after baking, pour the milk into the dish ans scrape the crust off using a spatula, mixing the drippings with the milk. Transfer the solution into a saucepan and allow to simmer on low heat. Mix flour and water separately using a whisk until lumps disappear. Combine flour solution with the milk and drippings, stirring slowly with a whisk until thickened. Season with salt and pepper if necessary. 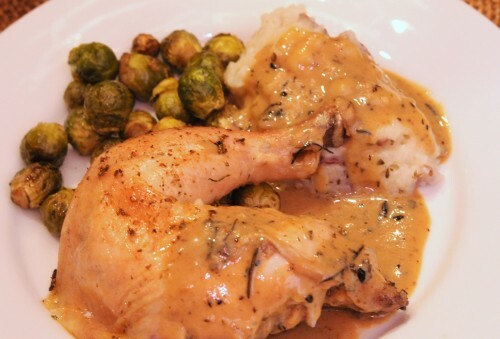 Remove from heat and transfer to a gravy boat and serve with baked chicken, mash and vegetables. This gravy will be rich with the taste of rosemary, oregano and garlic. Here it is served with brussels sprouts and truffled mashed potatoes. Mangia! From my childhood kitchen to yours! This entry was posted in holiday, meal ideas, meat, Recipes and tagged baked chicken, chicken on October 23, 2012 by admin.